We have recently added a portfolio view in ScrumPad. A portfolio in ScrumPad is a group of related projects. 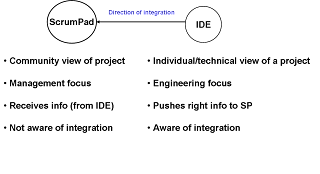 Traditionally these projects are managed under a program. From that perspective, "a portfolio" is the same as "a program." 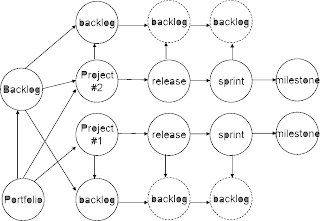 With current implementation, you can only view backlogs side by side for projects that you are a product owner on. You would still need to separately manage each backlog. Our ultimate goal is to allow driving multiple projects from a single backlog. This is the case with large projects where multiple teams work on a single integrated product. The best practice is to maintain a single product backlog. We have been brainstorming about how to support this while maintaining a flat structure among projects. We like to avoid hierarchical structure as much as we can. After a lot of white boarding, we came up with a solution that supports our goal of keeping the flat structure. What do we do with tags when moving a story from backlog to another since tags are backlog/project specific? What do we do with associated message threads, bugs, and impediments? What do we do if the story is already scheduled to a sprint and a release since sprints and releases are project specific? What if the story is assigned to a person who is not a member of the other project (team), which is most likely be the case. Should we allow a story "in progress" to be moved to another project? How do we integrate priorities across multiple projects into a single portfolio view? We are pretty excited about the portfolio management in ScrumPad. If you had to put together the best team possible for the most complex project and money is not a concern, who would you have on your team? I can tell you who would be on my "The Dream Team." Is this team going to be the most hyper-productive team ever in the history of software industry? Are they going to follow Scrum? Or, are they going to come up with something new? Should we call that "Scrum But?" Just wondering. Unfortunately, the reality is much more constrained. We need to work with a team that we can reasonably put together. The reasonable expectation is to have individuals who are average. I always wonder why people are so obsessed with hiring the best/brightest from Standford or MIT. I guess I do not fall in that category (and hence the grape is sour!)... :-) However, I sure can bet my money on my team that it can go head-to-head with any dream team in the world. I am sure so is yours. The focus should be "The Team," not the individual. Do me a favor, when you look for a new team member, mention in your Ad- "Looking for the best team member." What do you think? Who would be on your dream team?